What exactly is a Bowl Buddy, you ask? Far from it be an eating utensil! 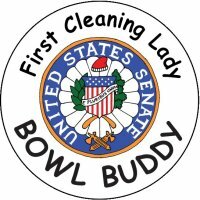 Bowl Buddies are toilet bowl brushes in the likenesses of President George W. Bush and Senator Hillary Clinton! Bound to lighten up the next campaign with hilarious results! While this is no “smear” campaign, you can count on your favorite (or least favorite) candidate to do a lot of “mud-slinging” this election year. With Bowl Buddies, tough toilet stains are “Mission Accomplished!” Next will be a Bowl Buddy in the likeness of Bin-Laden. Finally, someone has found a way to “flush out” Osama. Each Bowl Buddy will set you back by $19.95, and includes a brush, bowl, and side-splitting collectible box.